It’s a lovely hotel even though they’re doing refurbishments ( DUST TO GOLD) the resort fee of $44 a night and the $100 a night deposit takes a lot out of your vacay budget. The area was nice, if you want something quiet and off the strip. Clean rooms. Cool modern feel to them with nice large windows with good views. Gym and pool facilities are nice. A shuttle is available every 30 minutes that will take you to Ceaser's Palace leaving you at the heart of the strip. Good service from the employees in general here. Free parking is a nice thing too. I’ve enjoyed everything about this, except for the expensive 80$ cleaning fee. If it wasn’t for that, I would have had great value for the two nights spent. The suite was very nice, well decorated, modern, and comfortable, not to mention the fantastic view over the strip. It is also near affordable restaurants and is a short taxi ride to the strip. I would gladly book again if I can get the same rate or less. I stayed in room 39-301. Decent room with great view. You can tell the room and furniture have been used allot and looks a little run down. There is a 50ft balcony that is locked and you can not access. No robes, jets in bathtub do not work and there is no kitchenwear (which makes the kitchen useless). If you are looking for a room with a view only, this is the place. Staff at the Palms is very helpful and nice. Stayed at the resort for 6 days and would not go back unless for a SPA visit only. Also PALMS are redeveloping the hotel at this moment, which makes it even worse as there are building works taking place. Location is rather poor - far from the strip - no matter where you want to go - you will depend on UBER or taxi for pretty much every journey, and each will cost at least USD 10.00 (it is very hot and dry in Vegas - i.e. walking is not an option). Staff weren't the nicest either - at check in didn't get info about the hotel at all, nothing about Vegas, no recommendations, no suggestions. I Live in Europe - we do not have tipping culture - or rather - tip is given at discretion of a customer, when/if they are pleased with service they received. While at Palms (and in Vegas in general) I had the impression that everyone wanted tips for everything they done or said and it was awful. Also service was worse unless tips were given - so it was really bad. This location is away from the busy strip and bad traffic. Studio suite with nice mini kitchen and big pullout sofa. Room was very spacious and high ceiling. I love the room it’s very spacious and my boyfriend and I enjoyed the tub with the jets. Will stay again! The room itself was very clean, in a quiet part of the hotel as we requested. Terrific water pressure in the shower, loved it! Only drawback was drain in sink was a little sluggish. Room came with microwave, mini-bar and separate fridge with icemaker and coffee maker - all totally appreciated. Hotel location on Flamingo was near freeway for easy off and on but near enough the strip. On site parking for hotel guests is still free which can no longer be said for a lot of the big name hotels on the strip - this was one reason why I chose this hotel. Will definitely stay here again should we return to Las Vegas for another visit. I enjoyed my stay tremendously at this hotel. First of all, check-in was a breeze, real quick and easy. Next, was pleasantly surprised by how spacious and modern the room is. I stayed at room 12-320. Roomy bathroom and nice kitchenette which you can use if you choose to prepare your own meals. 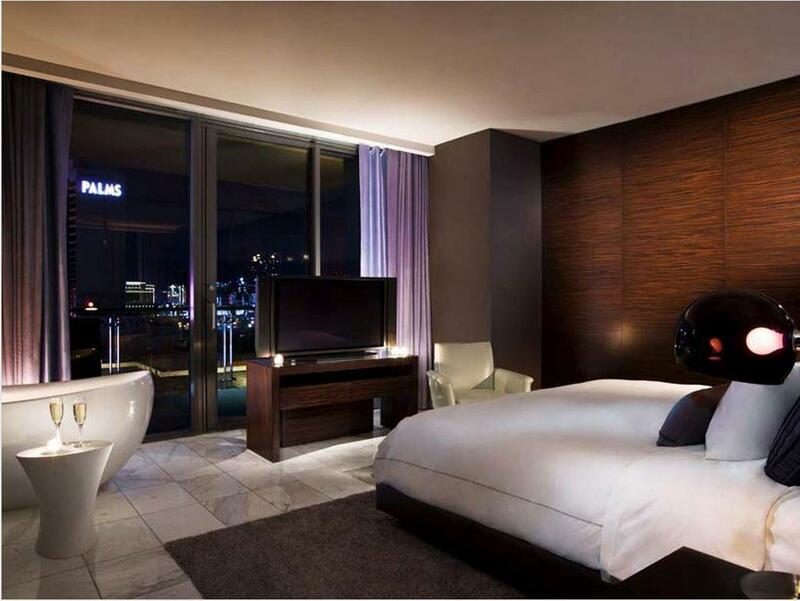 However, it will not be necessary as there are many reasonable eating options at Palms Casino and near the hotel. Most tour companies have free pick up for Palms Place so not to worry about booking your day tours too. Parking was easy and check-out was quick and hassle-free. Highly recommend this hotel. Stayed in a beautiful room on the upper floors, with jacuzzi bath. Great value for money. Ran into a serious problem when on arrival at 11pm, my room still needed to be cleaned so I could not check in. But problems happen, and in this case it was how the hotel staff responded that mattered. Received an upgraded room (much better) and more. Staff was very professional so when I woke up the next day, I had forgotten all about it and enjoyed my stay. Immensely.